In 1979 I was a svelt 235 pounds. 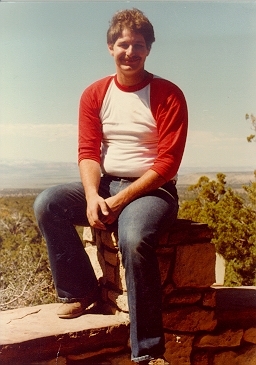 The photo to the left was taken in July 1979 at the North Rim of the Grand Canyon. Many times I can still see myself this way, but the years have caused the images to fade and, of course, my big body seems to overwhelm the smaller, more svelt me, that is housed inside it. 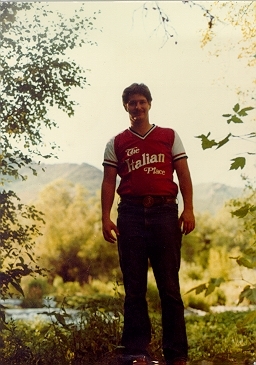 This is me in 1980 in my softball jersey. It is always a challenge, but I know I am able to get down. I must visualize it. I am tired of all of the things associated with being big. I am sick of it!! The ripped pants, the squeezing into movie seats, the “breathless moments” from hiking, etc. There are a number of “TMI” things that won’t get mentioned herein either. Instead of a finish line, I plan to do things day by day … diet, exercise, plenty of water, etc. It will be a process. Not so svelt Sumoflam at 450 pounds on April 1, 2015. There will be updated pics! Doctor Appointment in mid-May: I called the other day for my annual physical and was told that the earliest the doctor could see me is May 20th. I thought to myself, “Here is my chance!” My chance to reduce my weight, reduce my cholesterol and improve my other vitals. Great American Fitness Challenge: In my current work with BrainBox Intelligent Marketing, one of the projects I am working on is with the Great American Fitness Challenge team, preparing for the event in June 2015. One of the activities is a 5K and I want to participate. 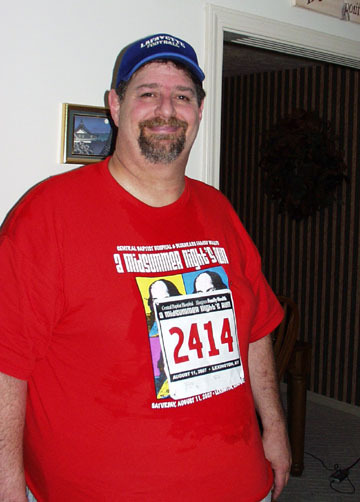 The last time I walked a 5K was back in August 2007. It was the Midsummer’s Night’s 5K Run. It was my first (and so far, only) 5K. 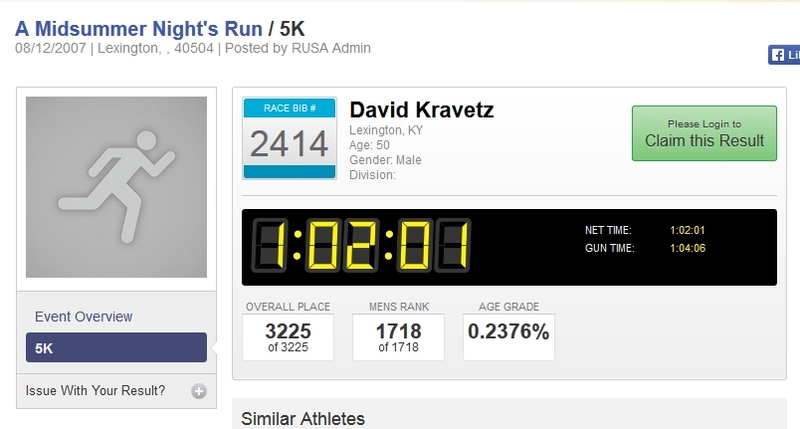 I was 3225th out of 3225 participants. 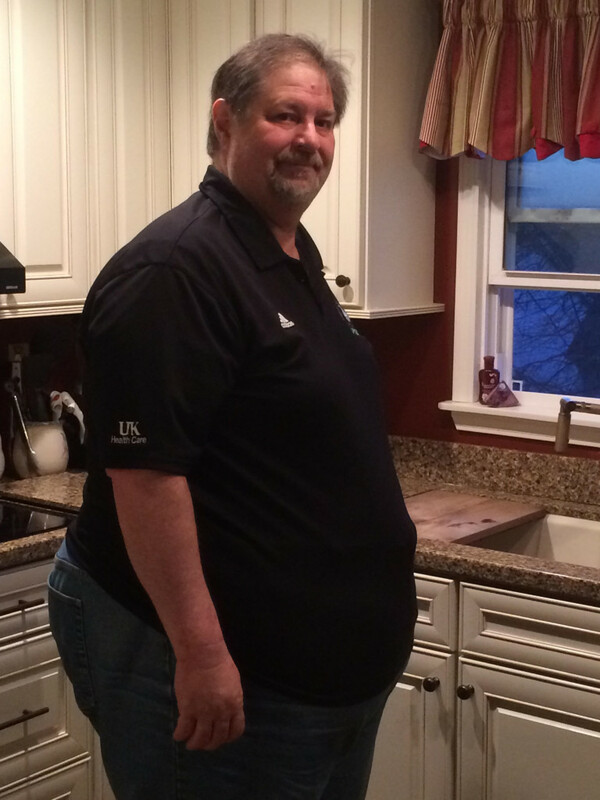 I was recovering from knee surgery and had lost a considerable amount of weight. The key was that I finished!! This is the result of my 2007 effort in the Midsummer Night Run. LAST PLACE! But I finished. So, these two events can rejumpstart my efforts. I have specific goals in mind…get my vitals improved, get some weight loss and walk the Great American Fitness Challenge 5K. And that is what I have realized…I MUST be able to please myself. Others may be happy. Others may give me the Rah Rah treatment as they cheer me on in my efforts. My wife may be thrilled to death. But, in the long run, if I don’t do it for me, it is not gonna be done successfully. 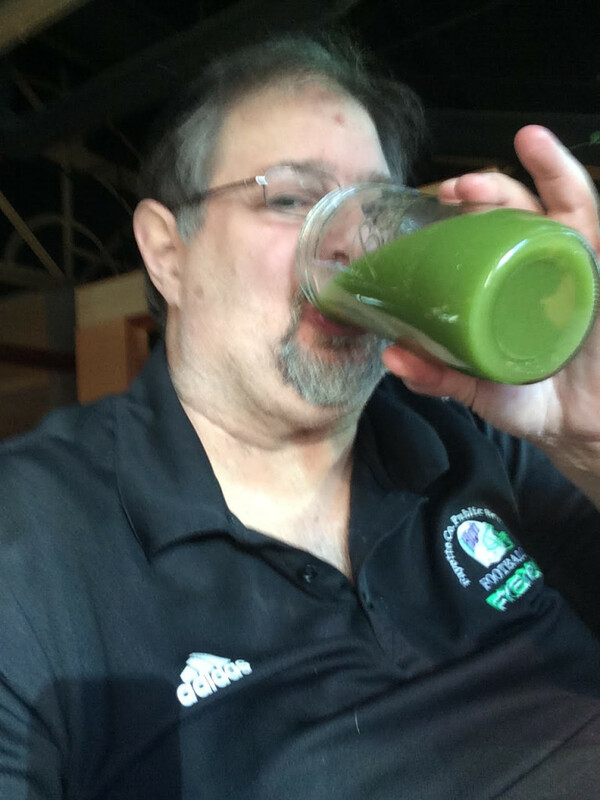 A Whole-food plant based meal regimen…with juice twice day (freshly made from 80% veggies, 20% fruit) and then a nice filling meal in the evening that may include beans or rice or potatoes and lots of good veggies. I will post daily…every morning, with results, falters, etc. I will include what I had to eat/drink. Go David! We are standing by with support! You can do it, and those goodies from our Bountiful Baskets will help! Thanks Trish!!! Hold me accountable! Sumo, I’m so there with you. I won’t post what I weigh at 60 years old and 5’4″ because I don’t know who can see it, but it’s far too much! I have totally changed my way of eating but need to cut down on the amount of wine I consume because all that is, is empty calories. I So need to learn how to love myself and do this for me. I cop out on a lot of things by saying I’m in pain all the time (which is true) and don’t do what I need to get done. Part of it is being alone all the time, not good for me because I’m a people person. I’ve been retired for almost 2 years now and still haven’t figured out my place in this world. Love you and pray that you succeed. All I can say is that I’m working on it and that I show the commitment that you do. Ione: Totally understand. I too use pain as an excuse. Today, I said heck with that….no pain, no loss! I am always there for you kiddo!! YAY!!! Go David!! I shall join you in this initiative. You are inspiration to many myself included. You are right you must do it for the right reasons. Which is sometimes the hardest. I want to lose for me, for my children, and my future grandchildren! Thank you for being such any amazing example in so many positive ways. I will always cheer you on!!!!! We love you and Juilianne so. Yay Lisa!! I am there for you kiddo!! Good luck DK. I would encourage you to do some peer reviewed research on diet as well. We tend to think that moving to a plant based diet will make the weight fall off, but in reality, that’s not sustainable…mainly b/c manly men like you and I like meat. Animal proteins are vital to long term health and a well balanced meal (including lots of veggies too) is a sustainable plan. I’m always in your corner buddy and can’t wait to see the results. Thanks Billy!! Means a lot coming from you. And yes, I still like meat!! Very exciting kick-off, David! I look forward to following your journey. Someday you’ll be ready to share it on Discovering the Word of Wisdom: http://discoveringthewordofwisdom.com. You go, bro!